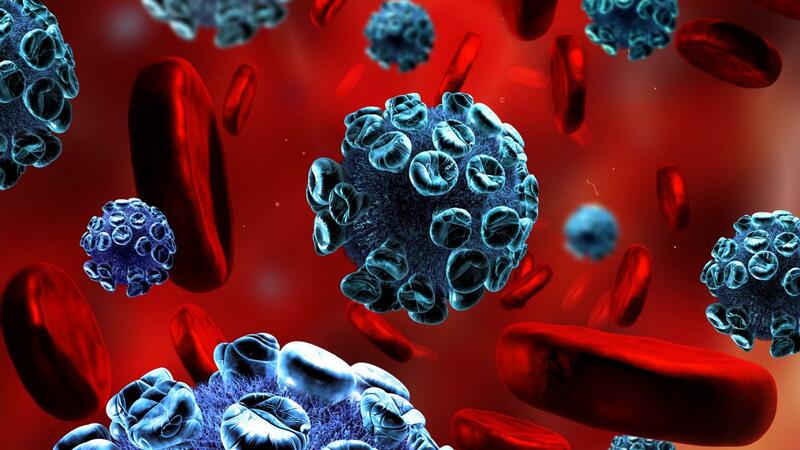 Human immunodeficiency virus is a spherical external capsule with a size from 100 to 120 nanometers. The virus envelope is dense as its surface is covered with proteins. Under the capsule there is a genetic virus program — two strands of viral RNA (ribonucleic acid) and enzymes necessary for its reproduction (reverse transcriptase, integrase and protease). HIV cannot multiply itself, it uses human cells to achieve this. In the first stage, the HIV surface protein gp120 binds to the CD4 receptor on the cell surface. In order to ensure that a virus can penetrate the cell membrane, it needs to have the co-receptor CCR5 (R5) or CXCR4 (x 4). Accordingly, there are three types of viruses: those that possess affinity to the R-5 co-receptor, to X-4 co-receptor or to both at once — R5X4. The virus then approximates the membrane of the cells which results in the fusion of the viral envelope and the cell membrane. In the second phase, the virus penetrates the cell and the virus contents (RNA, reverse transcriptase, integrase and protease) are released from the capsule. In the third stage, viral DNA is replicated. Viral DNA is synthesized using the reverse transcriptase enzyme based on RNA virus information. Then a viral copy is rebuilt to double-stranded DNA. Further, in order to get to the core of the cell and replace the genetic information of the virus, it brings with it a second enzyme, integrase. The challenge is to embed the integrase DNA virus in the host cell's DNA. It cuts the DNA and "pastes" the DNA of the virus there. After that the cell creates a viral RNA, from which the synthesis of viral proteins starts. Viral proteins are reproduced in the form of long chains. In order to cut it, the virus has the third enzyme protease. Due to protease action, individual components of the virus are released and are collected into a new virus. New viral particles detach from the surface of CD4 cells and enter into the blood stream, and the host cell dies after numerous cycles of synthesizing the virus. New viruses bind to receptors on the surface of other T-lymphocytes and the cycle repeats.